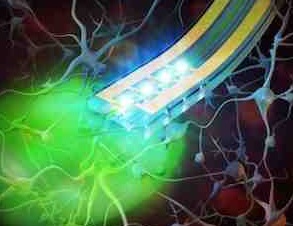 A team of researchers has developed a wireless device the width of a human hair that can be implanted in the brain and activated by remote control to deliver drugs. The technology, demonstrated for the first time in mice, one day may be used to treat pain, depression, epilepsy and other neurological disorders in people by targeting therapies to specific brain circuits, according to researchers at Washington University School of Medicine in St. Louis, the University of Illinois at Urbana-Champaign and the University of Colorado Boulder. Artist’s rendering by Alex David Jerez Roman showing tiny, implantable devices that are capable of delivering light or drugs to specific areas of the brain, potentially improving drug delivery to targeted regions of the brain and reducing side effects.